The country has no intention of engaging in an arms race, although its military spending inches up as a result of economic growth, a legislative official said yesterday. The State Council, or Chinese Cabinet, has proposed that the country's 2007 defense budget be increased by 17.8 percent year-on-year. It will be deliberated and approved by the 10th National People's Congress (NPC), which opens its last session today, NPC spokesman Jiang Enzhu said. During the session, the top legislature will also discuss and decide on drafts of the property law, the corporate income tax law, and other important issues, Jiang, also a secretary-general of the meeting, told a press conference in Beijing. The proposed 350.9 billion yuan ($44.94 billion) defense spending accounts for 7.5 percent of the year's fiscal expenditure budget, a ratio similar to previous ones, which ranged between 7.3 percent and 7.7 percent in the 2004-06 period, he said. The rise in the defense budget will be pooled to improve wages and allowances of servicemen and army retirees to ensure their income growth matches the country's economic and social development, Jiang said. The People's Liberation Army currently has 2.3 million troops, according to China's latest white paper on national defense. In addition to improving training and living conditions of the troops, the planned allocation will be "moderately" earmarked for equipment expenses, and enhancing the defense and fighting capabilities of the armed forces in wars based on information technologies. The country's modernization of its national defense is still at the mechanization or semi-mechanization stage, according to a report in the Study Times, a newspaper run by the Party School of the Communist Party of China Central Committee. "If China does not catch up with the latest military changes in the information era, its defense capability will be less competitive and its peaceful development strategy cannot be guaranteed," the report said. Jiang said the Chinese government decides the size and use of defense expenditure in line with the principle of "coordinating development of national defense and the economy". The budget has expanded in line with economic growth in recent years. This expansion, however, is compensatory in nature, as actual military spending had dropped by 5.83 percent annually between 1979 and 1989, meaning the country has had a weak defense foundation to be reinforced. Despite the expansion, China's defense expenditure in 2005 $30.6 billion was only 1.35 percent of its gross domestic product (GDP), while the United States and Britain spent 4.03 percent and 2.71 percent of their GDPs for defense, Jiang said. "China sticks to a peaceful development path and follows a principle that its defense policy is defensive in nature," Jiang said. He stressed that China's national defense provides the guarantee for maintaining security and unity, and realizing the goal of building a moderately prosperous society. 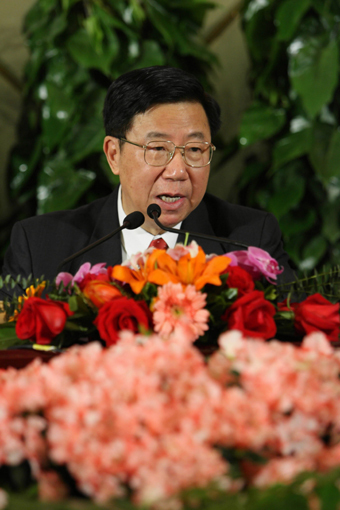 "China has no ability and does not intend to seek an arms race against any country," Jaing said. "China will not pose a threat to any country."